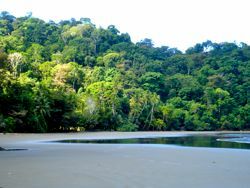 Feel the seclusion and beauty of palm-lined beaches bedded with primary rainforest! Explore the hidden treasure of abundant flora and fauna or simply relax and enjoy the solitude. The Violines Beach & Island Full Day Nature Tour leaves from Punta Uvita at 7:00 AM and arrives at Violines beach 1-hour later. During the 1-hour cruise enjoy the coastal sites of one the largest mangrove ecosystem of Central America near Terraba-Sierpe River. At Violines beach choose to explore the hidden treasure of abundant flora and fauna with your guide or simply relax and enjoy the solitude. During boat transit you may observe whales, dolphins, turtles, marine birds and fantastic views of the southern pacific Osa coastline. The boat returns to Punta Uvita at 4:00 PM.